The mission of the Gene Conservation Laboratory is to protect genetic resources and provide genetic information and advice to department staff, policy makers, and the public to support management of resources consistent with the mission of Alaska Department of Fish and Game. The Gene Conservation Laboratory describes and protects the genetic diversity of commercially important fish and shellfish species in Alaska by providing high-resolution genetic analyses to fishery managers, decision makers, and the public (see Publications and Reports to the Board of Fisheries). Maintaining the genetic integrity of wild populations sustains their ability to remain productive in a fluctuating environment and perpetuates Alaska fisheries for the long-term. We work with fishery managers and stakeholders statewide to design projects that best meet management concerns, employing sophisticated data management techniques and advanced analytical approaches to population genetics. Through our extensive sampling efforts over a broad geography, we maintain and develop improved genetic baselines for species, which are then used to understand the structure of populations, estimate the composition of mixed stock fishery harvests, and provide advice on the potential genetic effect of human activities on fish populations. The laboratory works closely with other scientists at similar labs worldwide to standardize methods and improve techniques, providing world-class expertise in genetics, population dynamics, biometrics and salmon ecology and life history. The Gene Conservation Laboratory houses Alaska’s statewide fisheries genetic information and tissue collections for the Department of Fish and Game. 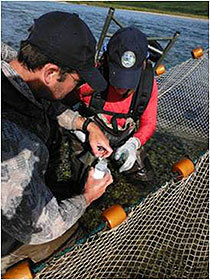 Glossary of Terms for Salmon Management and Glossary of Terms for Genetics Analysis.